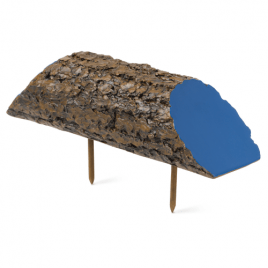 The Tee – New Tee Markers are a must to brighten up the tee area, they come in different shapes, materials, sizes and prices. From the traditional Branch Tee Marker to the timeless Pear Shaped Tee Marker or for something a bit special the Fusion Cast Tee Block Marker. 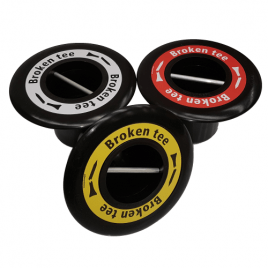 Or if you want to keep your tee area clean and broken tee free have you thought about Broken Tee Caddies which can double up as a Tee Marker. For something a bit special what about Mow over Broken Tee Collectors which also double up as Tee Markers. 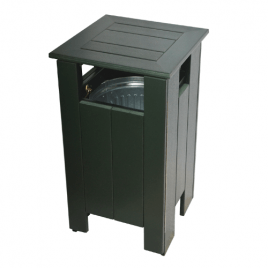 Not forgetting the Ball Washers of course and if you wanted to splash out a Tee Console System which looks great with the Pattisson’s Teak Bin. Finally, the Divot Box, a must to fix those divots, from moulded plastic to teak, whatever fits in or goes with your course furniture. 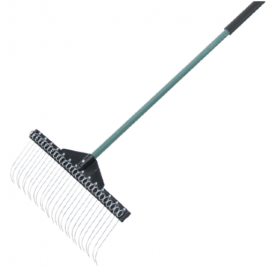 The Fairway- Rakes, Rakes, Rakes, so many to choose between, curved head, straight head, wooden handle, aluminium handle, fibreglass handle long tooth, short tooth or even no tooth like the new Chief Rake for the “Aussie Style” of bunker maintenance. So many to keep your bunkers smooth and how you like them to look. 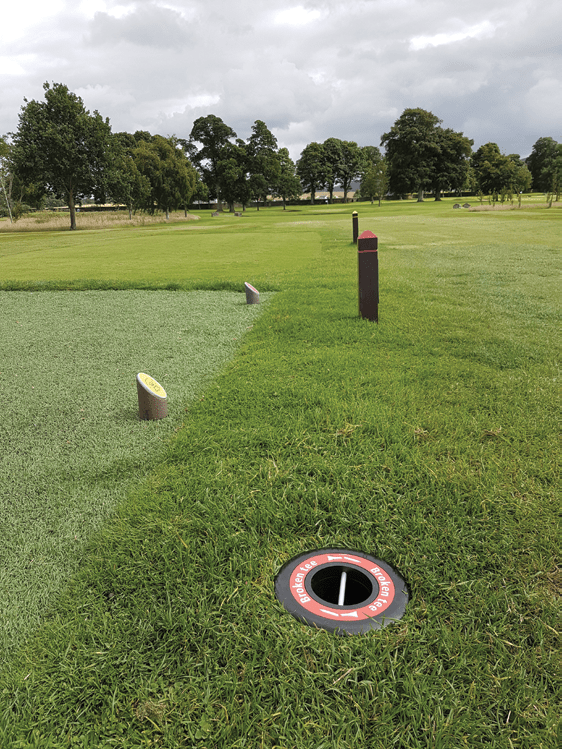 Our Hazard, Out of Bounds and Red Penalty Markers are made from Premium Recycled Plastic and last for years, are UV stable so are maintenance free and stay looking good. 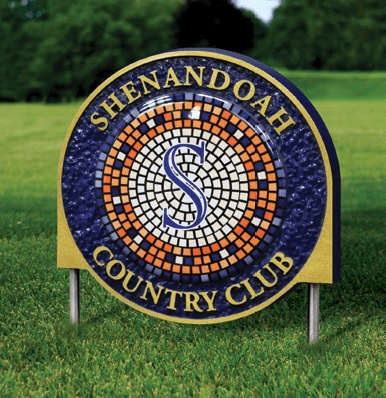 Yardage Markers, something for everyone, whether you prefer round, domed or posts. 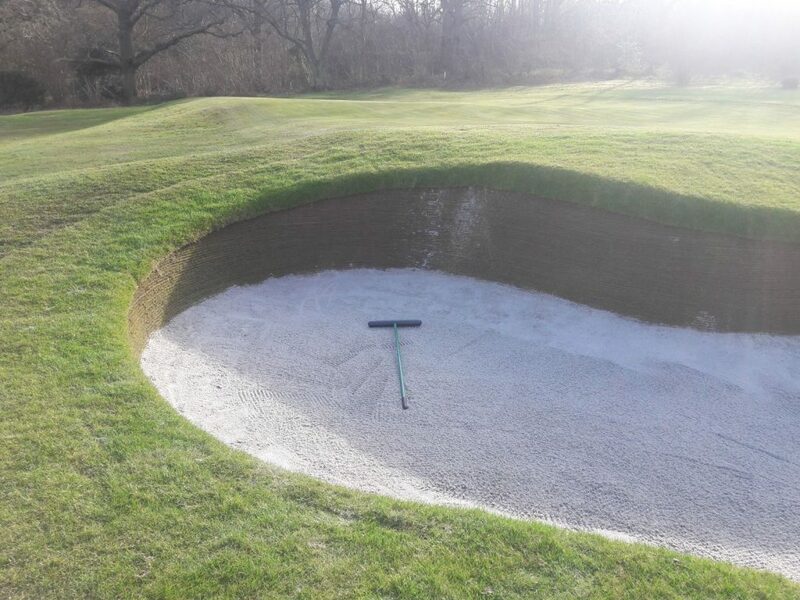 Thank you to Farnham Golf Club for providing photo’s of their freshly raked bunkers. 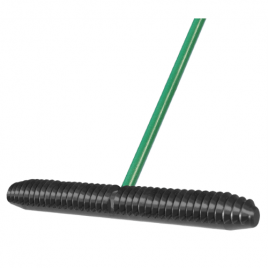 Pattisson Pro Rake used to create textured bunker with smooth outer ring. The Greens- Hole Cups, Flagpins and Flags are a must to freshen up your course. The Golfer is confronted with cups, pins and flags at each hole so it is important to have nice new ones in place. According to the USGA, under Rule 13.2a(2), “There will no longer be a penalty if a ball played from the putting green hits a flagstick left in the hole.” Players will still have the option to remove the flagstick or to have someone tend the pin and remove it after the ball is struck. If players decide to leave the pin in the hole while taking a shot, it is important that the base of your flag pin isn’t too thick or the ball will deflect off it and not go into the hole. Painted flag pins can be prone to chipping but Vinyl Guarded flag pins tend to be more durable. 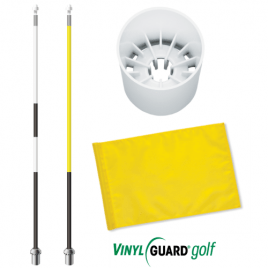 TJ Striped Vinyl Guard Flag Pins Regulation ½” or Tournament ¾” are made under licence in the USA and feature through resin impregnated pultruded fibreglass. Precision ground and then highly polished by hand. Our striped flag pins are then Vinyl Guarded to give classic looks along with superb durability. 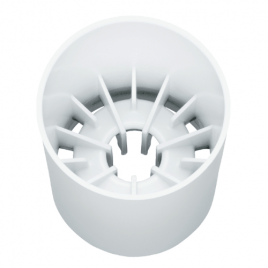 There are many hole cups to choose, whether it be plastic, aluminium or hybrid. Our best-selling cup is the ST2000 and has been a favourite for several years. 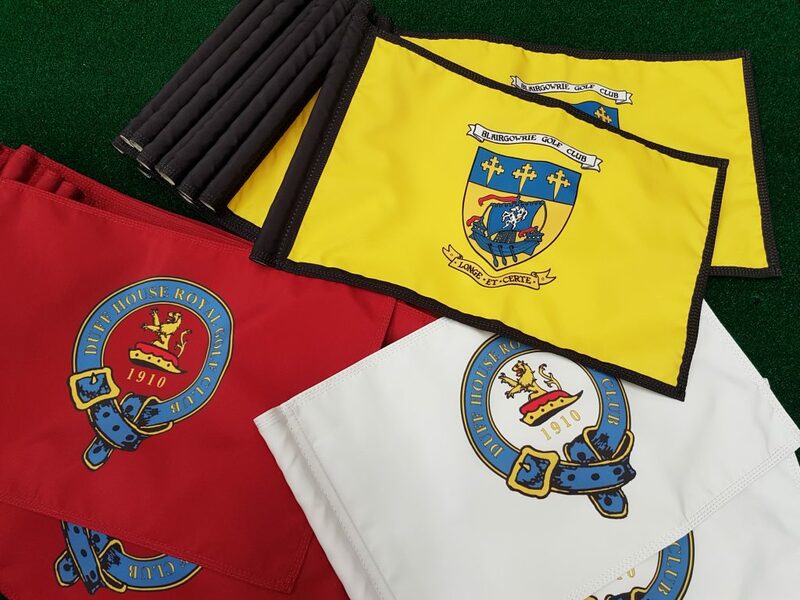 Flag varieties are Tube Lock or Tie On which can be plain, numbered, chequered and printed or embroidered with your club logo. 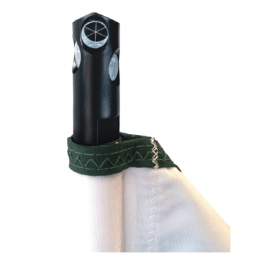 Tube Lock flags are the most popular thanks to their ability to swivel around the pin according to the wind direction. And of course we mustn’t forget the Greenkeeper’s tools required to get these jobs done. 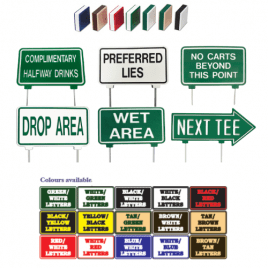 Around the Complex- Signage plays an important part, whether it be a warning, instruction or notification for the golfer. The aluminium signs are the most economical but if you are looking for something a bit different there’s the Eco Lined Engraved Plastic or the Teak Signs. To keep the litter where it belongs litter bins must be in place. 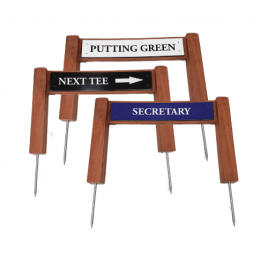 These are designed to suit your taste or to fit in with other course furniture. There’s plastic, metal, teak and the new Technowood which is premium quality recycled plastic with revolutionary gloss surface coating. Rope and Rope Stakes to cordon off areas, again recycled plastic are more popular as they require no maintenance and last for years. These are just some of the core products we recommend to keep your course looking in pristine condition. 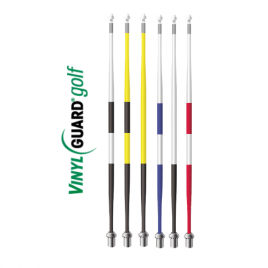 New ¾ Tapered Tournament (Javelin) Striped Vinyl Guard Flagpins. 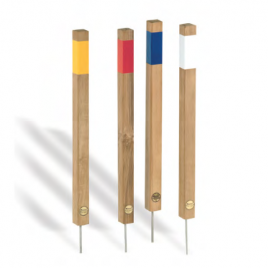 Our new style flagpins are made under license in the USA and feature through resin impregnated pultruded fibreglass. Precision ground and then highly polished by hand. 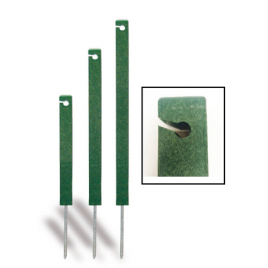 Our striped flagpins are then Vinyl Guarded to give classic looks along with superb durability. 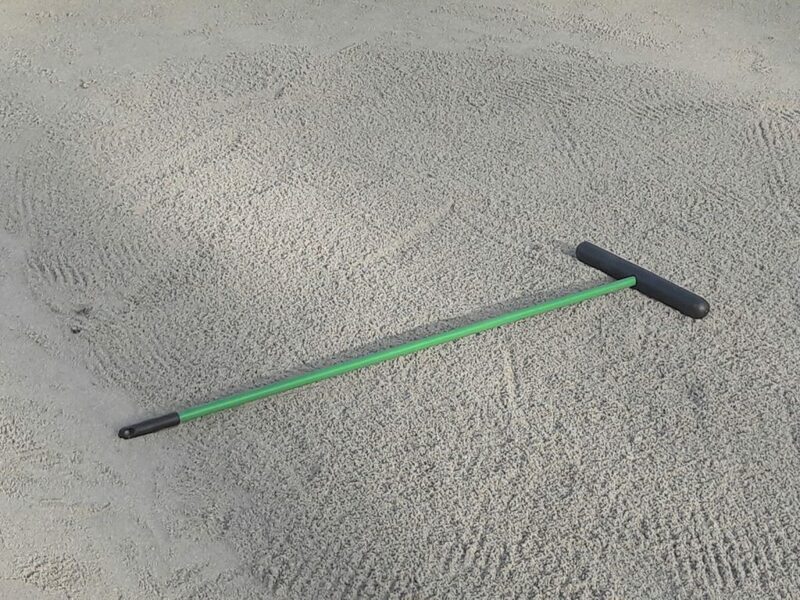 Revolutionary new 2 in 1 bunker rake. One smooth side for rolling the vertical face of the bunker and the other toothless side with ridges to give a consistent lie at the base of the bunker. Fewer plugged balls equate to quicker rounds of golf! The head will fit most of our American sized handles as well as our gold curved rake handle. This product is available for pre-order with the first delivery expected mid May 2018. Made from top quality teak wood, they are harvested along the international regulations regarding conserving the forest by replacing trees. Handmade to get that original traditional look, maintenance free and long lasting. These signs come with a di bond plate in the colour and with the text of your choice. Size: (H) 57cm x (W) 35cm x (D) 5cm. Please state the colour and text required. 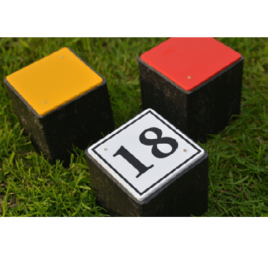 A traditional cube tee marker manufactured from extremely durable black recycled plastic material. This tee marker looks great on the course. Measures 80mm x 80mm x 80mm with 2 galvanised spikes and a coloured plastic end cap secured with two brass tacks. Also available numbered or with logo, please contact the office for more details. 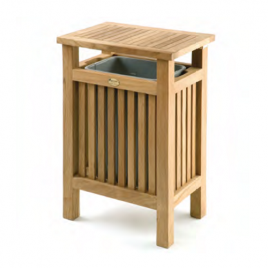 Made from durable Resin with a very natural, rustic look. 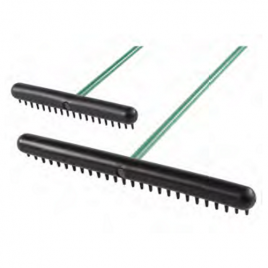 Ends are slanted for more visibility, comes with 2 x steel spikes. Size 20cm x 10cm. New and improved Eco Line manufactured and branded for TJ Golf. These superior quality recycled rope stakes are virtually unbreakable, UV stable, never need painting, maintenance free and they float. Top quality finish with radiused sides and top, speed slot and zinc plated spike. Available in 3 different lengths. Alternative colours available on a 6 week lead time.